It's been back to the Barossa for me this last fortnight and there's one big advantage of staying with a winery owning brother. You get to try wines at his expense that have escaped your attention as a Glug internet customer! It makes for a very satisfactory holiday. And amid all the sipping and swirling I have certainly discovered some gems that will be on my order form when I return to Canberra. Or perhaps I should say rediscovered some gems, for one of them is a wine I enjoyed when his Goat Square Barossa Shiraz first entered the Glug portfolio some eight years ago. I don't know why it dropped off my radar but I notice now that it's down to a most economical $9.99 a bottle. How long it will be there I know not but I fear we consumers will be facing some price rises across the board in the very near future. The wine industry people I have been speaking and drinking with in the valley are in a happier mood than I have known for years. Australian wine exports are going gang-busters with the Chinese market becoming something of a bonanza as it soaks up surplus stock. For we drinkers it's probably a good time to restock the cellar. My brother refers to the Goat as one of Glug's special wines. The Barossa Valley is a small, rare, unique piece of the earth's crust and only from this spot do you get red wines which display such a powerful and unusual concentration of mid palate weight. At times the fruit is so intense as to appear sweet a feature which can make wines which live for 50 years. The Goat Square wines come from a group of vineyards in the northern Barossa and any that look more interesting and intense than others are separated for the Goat. 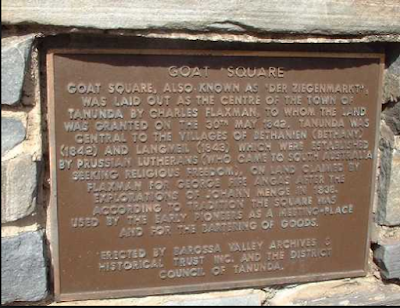 The wine is named after Goat Square which is an historic location in the centre of Tanunda which in the 1840s to 1860s was a weekend market place, particularly for livestock. This is the 8th vintage and the second and final bottling of about 150 cases. The winemaker is Benjamin Parker and we refer to Goat Square as the salt of the earth. Goat Square Barossa Valley Shiraz 2015. As something of an expert BWS and Dan Murphy shopper I can tell you that when it come to value for the dollar the wines of Glug beat hands down those I often buy when I forget to restock on-line.